On 11 March 1819, John Keats took a walk across Hampstead Heath and on the way met Coleridge, who was living in Highgate at that time. According to Keats, they talked of ‘a thousand things’ including Nightingales, poetry and dreams. Coleridge recalled the meeting quite differently. As part of Keats200 we will recreate this historic meeting, led by our historic enactors and talk of many things as we enjoy a walk across the Heath. The event will begin at Coleridge’s House in Highgate, arriving at Keats House, Hampstead approximately 90 minutes later. We will be walking across the Heath, which may be muddy whatever the weather. Please wear appropriate footwear and clothing for the conditions expected on the day. The legendary meeting between Keats and Coleridge saw a wonderfully fortuitous convergence of personalities, poetry and circumstances, with momentous consequences for the course of English poetry. This talk by Professor Kelvin Everest examines the many strands which met in that meeting and considers the great poems which resulted from it. Join us to celebrate two of the Romantic period’s most iconic figures. In April 1819, John Keats and Samuel Taylor Coleridge met on Hampstead Heath, where the older poet Coleridge, according to Keats’s account, ‘broached a thousand things’. 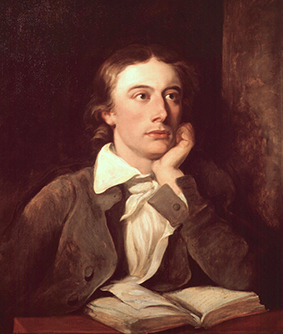 This reading by the Keats House Poetry Ambassadors will certainly touch on some of them - nightingales, metaphysics, dreams, ghosts – as presented in the poetry and prose of both writers.